The threat of Lyme disease afflicting "man's best friend" is reason enough to learn how to get rid of ticks on dogs. How to get rid of ticks on dogs? There are wrong ways to do it (forget the "lit cigarette" trick, among others), and there are right ways to do it, as discussed in our post. Ticks are eight-legged arachnids—meaning they’re not actually insects—that feed on the blood of mammals. When they feed, they usually spread disease. Nasty critters. If you’ve experienced the discovery of a tick on your pooch, your instinct likely was: Grab it! Before you dig in, though, it helps to know how to get rid of ticks on dogs as carefully (and quickly) as possible. We have the answers. If you find one tick on your dog and it hasn’t bitten the dog yet, try to grab it with a tweezer. You then need to destroy the tick. One of the simplest methods is to drop it onto the sticky side of tape (masking tape, duct tape, even packaging tape) and then roll up the tape and toss it. You can also put the tick into a small cup of alcohol to kill it. Don’t burn the tick off with a match or anything else. Forget trying to suffocate it with petroleum jelly or mineral oil. You can’t even drown ticks because they can live underwater for a few days (even though they can’t swim). Finally, never use gasoline, motor oil, or any other caustic or flammable material. All you’re going to do is injure your dog. 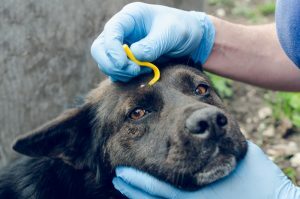 A special tick-removal tool like the one being used here is designed to secure the tick by it’s mouthparts, as close to the dog’s skin as possible. It’s smart to keep a tick remover in your first aid kit. The tool looks like tweezers but it’s designed to make it simpler to grasp the tick near its head. (A favorite among pet owners is the Pro-Tick Remedy). However, a pair of tweezers will work just fine. If you have them, wear disposable plastic gloves when you remove the tick. Carefully grasp the tick as close to the skin as possible, as you’re trying to be sure the head comes out with the body. Once you’ve grasped the tick, pull using a slow, steady movement. 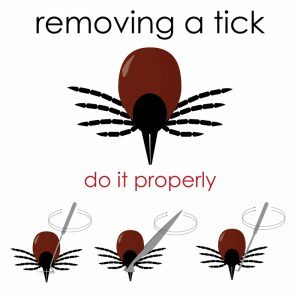 If you’re sure you got the entire tick out, clean the area with soap and water or an antiseptic wipe. Or you can let it be. As reported at Dogster.com, “If there are any parts left, i.e., mouth, head, etc., the body seals them off and they’re rejected with the scab. Any tick bite, however, no matter how the tick is removed, will need to be watched for signs of infection.” So if your dog starts biting or scratching at the site of the tick bite, or if it becomes infected (swollen, red, painful, inflamed), get to the veterinarian. Check your dog’s entire body for other ticks, especially around his face, ears, between his toes, up in his groin area, tail area, and armpits. If you find multiple ticks on your dog, you should schedule a visit with your veterinarian. He or she will remove the ticks, and it’s very likely he’ll want to medicate your dog to get a jump on any diseases the ticks may have transmitted. In fact, even with one tick, your dog may have been infected. The rule of thumb is that it takes 24 to 48 hours for a tick to transmit disease once it bites the host. Now, however, some researchers believe that as soon as a tick latches on and begins to feed, the tick transmits saliva into the victim and, with it, disease. Babesiosis: Anemia, pale gums, weakness, and vomiting. Bartonellosis: Intermittent lameness and fever. Hepatozoonosis: Fever, runny eyes and nose, muscle pain and diarrhea with the presence of blood. Ehrlichiosis: Fever, loss of appetite, depression, weight loss, runny eyes and nose, nose bleeds and swollen limbs. Lyme disease: Stiffness, lameness, swollen joints, loss of appetite, fever, fatigue. Rocky Mountain Spotted Fever: Fever, stiffness, neurological problems, and skin lesions. According to the Centers for Disease Control and Prevention (CDC), signs of a tick-borne disease may not appear for seven to 21 days after a bite. Watch your dog closely for changes in behavior and appetite that might indicate a disease that might prompt you to bring him to the veterinarian immediately to begin treatment. Ticks cannot handle the sun; it dries them out. So generally, you’ll find ticks in tall grass and in wooded shady areas. They like to hide in leaves on the ground, so be careful of that leafy mulch pile. Ticks can’t fly or jump. They crawl to the top of a blade of grass and wait for the chance to climb onto a potential host. Not surprisingly, the answer to “How to get rid of ticks on dogs?” actually may start with keeping your lawn short. Ticks are hardy, but they do not move around much in very cold weather; in freezing temperatures they shelter under mulch and leaf piles. Ticks need 85 percent humidity and temperatures of at least 45° F to be active. A “moat” of diatomaceous earth will also both repel and help kill ticks. You will need to replace and redo the application of diatomaceous earth after heavy rains or monthly. Today’s flea-and-tick preventatives for your dog are far stronger than in decades past. 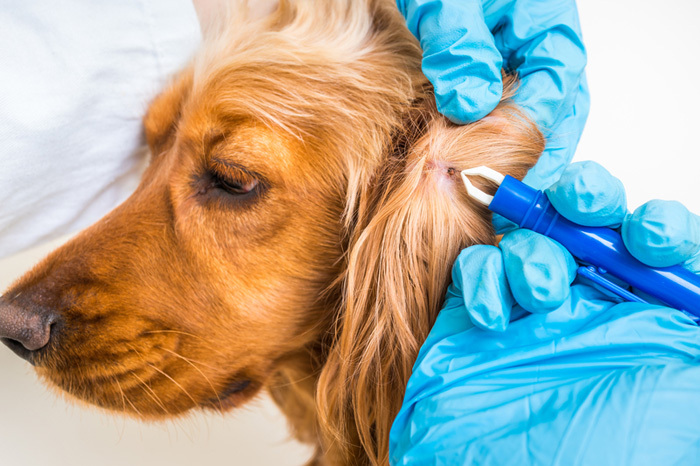 Oral tick treatments like NexGard and Bravecto require a veterinarian’s prescription. These pills are easy to administer, given either monthly (NexGard) or every three months (Bravecto), and kill ticks in 24 to 48 hours. Topical products (often called the “spot-on” products) vary somewhat in whether they also repel or only kill biting ticks. These are available over-the-counter (without a prescription). The big guns are the Frontline and Advantix formulations—liquids placed on the dog once monthly. The drug spreads over the dog’s body. Some dog formulas are toxic to cats, so be sure to discuss your choice with your veterinarian if you also have a cat. Ticks are killed in 24 to 48 hours. The Seresto collar is gaining popularity for its simplicity and non-prescription availability. Unlike the old flea collars from years gone by, Seresto collars last eight months and are proving to be effective. The collar slowly releases the active ingredients to the lipid layer of the dog’s skin and hair. Ticks are killed with 48 hours. Powders, sprays, and dips are still available, but if your dog is frequently in areas where ticks are a problem, one of the above three categories may well be your best choice. These older products often require frequent reapplications and can be irritating to both you and your dog. alcohol, anemia, appetite, depression, diarrhea, ears, garlic, health, infection, lavender, lyme disease, muscle, muscle pain, newsletter, nose bleeds, oregano oil, oregano oil benefits, pain, skin, weather.